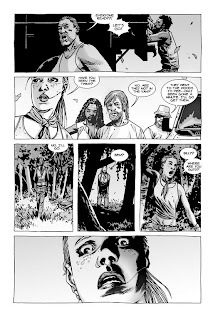 What does Andrea see? I can only tell you that it isn't pretty. 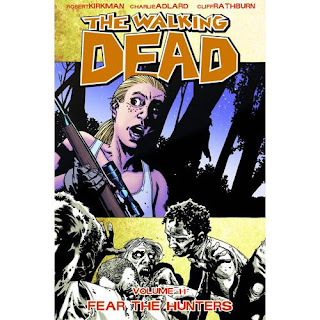 I just finished Robert Kirkman's zombie masterpiece; Walking Dead volume 11, and I have just one question; how the Hell does Kirkman not only keep the writing and stories fresh, but how does he manage to make it better with each volume?!? Anyone who reads this knows that the zombie thing really takes a backseat to the intense character studies of our key players and how people would cope if something like a zombie apocalypse really did occur. Just when you think Rick and company have experienced every possible example of human depravity and evil, something new and terrible pops up! I won't spoil it for you, but I'm surprised I didn't see it coming! I really can't wait to see how AMC brings this story to life on the small screen. Just got and read vol 10 & 11 myself. Great reads! Can"t wait to see the series... Thanks for getting me addicted to this! See there - being a comic geek isn't so bad, now is it?